Upcoming forum: what does it really take to be an Employer of Choice for Gender Equality? We have arrived in Autumn, Melbourne’s loveliest season - in my opinion anyway! We are looking forward to celebrating International Women’s Day next week with a host of events around Victoria. This year QV Women's Centre are again hosting a series of forums and I am looking forward to participating in the forum on the Evolution of Activism, a very ripe area of discussion for women with disabilities! Are you a tweeter or is banner waving more you style? Come along and join in the discussion. Thank you to those members who completed the Member Survey in December. We learned a lot from your feedback. We learned that members think that on the whole we have our priorities where they should be, and also that members would like to know more about the NDIS. Besides our factsheet on how women can best use the NDIS we will be keeping our members up to date with information as we acquire it. For example, this week DARU held a terrific forum on the NDIS which included Kylie McCutcheon sharing her story of making an NDIS complaint. Feedback from members also noted the importance of access to health services so I was very excited to attend the Cancer Council of Victoria’s launch of Overcoming the Barriers. This is an online information tool to promote bowel, cervical and breast screening to people with disabilities and support workers. Happy International Women’s Day to all women around the world and especially to the Women with Disabilities Victoria community. 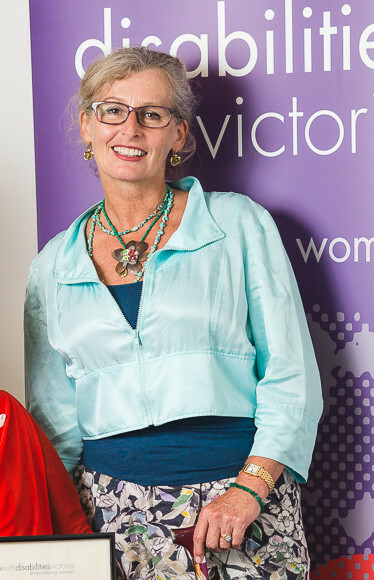 Women with Disabilities Victoria is partnering with organisations in Bendigo to deliver the Enabling Women Leadership Program in Bendigo in May/June this year. A repeat session may be held at 5.30 that day if there is demand. RSVP essential for the 5:30 session. Contact: Cath McNamara at WDV if you would like to attend the information session or have a query. Phone – 9286 7810, email – cath.mcnamara@wdv.org.au. As part of our series on WDV Board Members, in this issue we profile Marija Groen. As Chair of WDV, Marija draws on her experiences as a woman with a disability and over 25 years experience in leadership roles in the community sector. 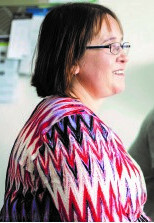 Marija has areas of expertise in disability housing, homelessness and family violence. We asked Marija a few questions about her work and interests. What made you interested in joining the WDV board? "I was inspired by the staff and then board members of WDV - their commitment and passion matched mine." Is there a leader or role model that you admire? "If I think of Feminists like Emily Pankhurst and Vida Goldstein I am in admiration of their ragged determinism. They were at points of history where they were fighting against many odds. Women of today still experience positive repercussions from their actions." What would you most like to change for women with disabilities? "We should have affordable, universally designed, appropriate hosing in every part of Victoria." What does the ideal day involve for you? "Waking up to my kitten and sausage dog leaping all over me in bed, the joy and pleasure of a simple breakfast together, well made coffee from my partner and being still in my panamas at 10am." When Kylie McCutcheon asked to have physical therapies included in her NDIS plan and was told no. Her health, her study and her parenting suffered. She made an appeal and eventually the appeal was successful. An important turning point was when she was able to use her personal experience as evidence for why she needed physical therapies. She shared her story with VCOSS's 'Insight' (extracts follow) and at the March DARU forum (DARU published resources about Kylie's story). Kylie's story: "I am a single mum, with a young daughter. I used to work managing an Op Shop and cleaning houses while studying to become a kindergarten teacher. Mobility-wise I’ve been up and down over the years... If I stop doing the things I should be doing, like my chiropractic treatments and physiotherapy program, I go downhill real fast. My spine gets very stiff and sore until eventually it ‘locks up’, my nerves get compressed and it affects my ability to walk. The state and federal governments had an agreement that no one would lose services under the NDIS. But when I got my new package under the NDIS, it didn’t include any physical therapies, including chiropractic treatment... When I asked why, they told me the NDIS doesn’t fund physical therapies, and I would have to fund them myself if I wanted them. I was stunned really... They gave me a folder with all these pieces of paper, which said if you weren’t happy with the decision you could ask for an internal review. So I wrote a letter and emailed it to my NDIA worker. They took a long time to get back to me. The NDIS reviewed the decision and did not change Kylie's plan. "In amongst the fine print it said you could request an external review, but it didn’t outline how to do it... I hit a low. I was starting to struggle with depression and emotional stuff because my body was falling like a stone. I’d gone from working and studying to barely being able to walk from one end of the hallway to the other. So between the physical struggle of it, the increased pain levels, and the doctors prescribing more and more powerful pain killers that create a bit of a fog in your mind, nothing was clear any more. I couldn’t do the things I needed to do, I couldn’t take care of my child the way I wanted to, my house looked like a bomb had gone off in it and I had not much to lose." At the tribunal Kylie presented her personal experience as evidence. "That was the first time they had taken lived experience into account. Before that, evidence heard was mainly from providers or therapists or medical models. But while sometimes research and evidence can be shown to be invalid, you can’t ever say someone’s lived experience is not valid. And now if a person says they’ve had this lived experience, that’s something the NDIS workers will need to take account of in their plans, they can’t just dismiss it as something that doesn’t count. It’s a really good start to actually listening to people who are experts in their own conditions, having lived with their conditions all their life, over a medical professional who sees you for maybe 15 minutes every two or three months, who actually doesn’t live with it. If Kylie was to give one piece of advice, "there’s millions of things I could say, but I guess the main thing is “find someone to help you if you need it, and keep moving forward, don’t go backwards.”"
The Cancer Council has launched online training to inform all people who care and support people with disabilities on how to speak about cancer screening. The Overcoming the Barriers online training modules were designed by experts in the field of disability support and cancer screening, with regional and rural disability support workers in mind. The modules present evidence-based strategies to overcome the complexities of accessing national bowel, breast and cervical screening programs for their clients. See Cancer Council's Media Release. Women's Health West is advertising several roles including a health promotion worker and a family violence intensive case manager. Both roles have a focus on working with women with disabilities. Women with disabilities should consider applying. Smalltalk Playgroups run Mondays mornings at Salvo Connect Child Care Centre, 6 Crompton St Soldiers Hill. The groups are to have fun, meet others and feel supported. There is no cost and a light morning tea is provided. Contact the Facilitator Barbara Cook, 0427 300 460. The Guardian reports, "In a rare show of solidarity, academics, disability practitioners and activists all agreed the stories we tell around disability have to avoid merely tugging on the heart strings in order to make any real lasting social change." 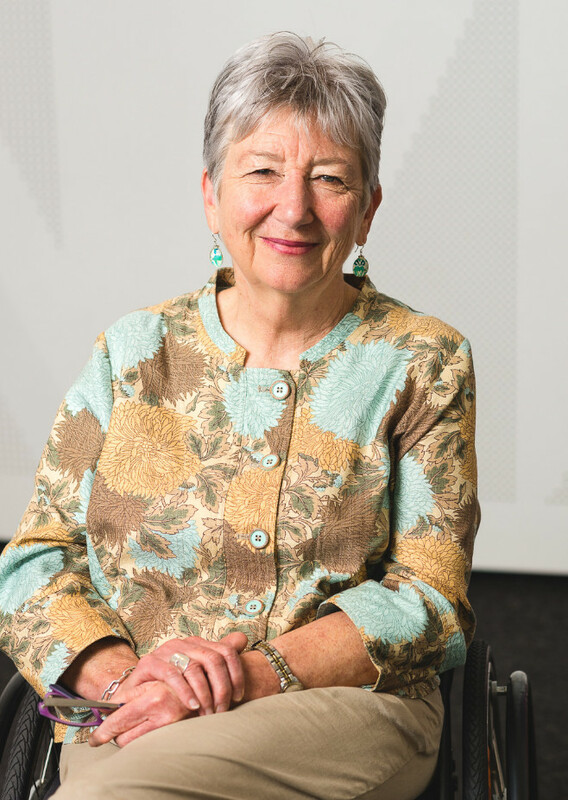 "As you would expect, the economic and social welfare of disabled Australians was the key point of discussion at the Disability, human rights and social equity conference held at the University of Melbourne." WDV Members and Board Members were at the conference, and WDV staff made 2 presentations - Sharon and Cath presented on Enabling Women and Jen presented on responding to violence against women. Read the full Guardian article. The Equal Opportunity Commission is running a training session is for community advocates and self advocates. The session is on how to use Victorian human rights and equal opportunity laws to strengthen your advocacy. Details: 10th March, 10:00am - 1:00pm, Carlton. Bookings are required. The Victorian Trades Hall Council is now holding the Women’s Rights at Work Festival in celebration of International Women’s Day. Why celebrate International Women’s Day when you can celebrate International Women’s week! Get involved through the calendar of events, or the Facebook page. An upcoming presentation and Q&A will provide participants insights on how to effectively complete the 2016 WGEA Employer of Choice for Gender Equality application (due on the 31 July 2016), critically interpret the criteria and data requirements and juggle the immediate and long term requirements to achieve the prestigious citation. The event is organised by the Equal Employment Opportunity Network. It is an opportunity to explore what gender equity looks like in workplaces and examine aspects of the 2016 EOCGE criteria in detail. Successful recipients of the citation have a proven track record in improving culture, reducing pay gaps and increasing representation of women in leadership. This event will be of particular interest to diversity and HR practitioners seeking to move beyond compliance reporting. Cost: Free EEON for members, $50 non-members. Book for the EEON event. Applications for the Stonnington Council's community grants program are open until Friday 1 April 2016. The Exclusion and Embrace: Disability, Justice and Spirituality Conference will run in August in Melbourne. If you would like to make a presentation, send in your abstract by 10 April, 2016. Sunrise Women’s Groups bring together women living with a disability and/or mental illness who want to meet other women, feel more connected and learn about staying healthy. Groups do lots of different free activities that are chosen by the women in the group. Sunrise groups get together fortnightly in Laverton, Sunshine, Wyndham Vale and Melton. There is also a new group open in Melton for women who are carers of someone with a disability and/or mental illness. All groups are open to women aged 18 to 65. Contact Lauren on 9689 9588.